▲ Dongguk University baseball team celebrating their victory. On May 19th, Dongguk University baseball team won the 71st National University Baseball Championship after fierce battle with Chung-ang University. Dongguk accomplished five consecutive wins from May 11th until 19th. The first opponent was Seoul National University. Dongguk won points every inning except the third and the opponent was not even able to hit one ball. The game ended in 20-0. Second game was against Hongik University. The atmosphere was intense as Dongguk had a reversal game against Hongik. even ending in bench clearing. Still, Dongguk won the game in 7-4. Then, Dongguk University faced Youngdong University and Yonsei University. Both games had smooth ending in 7-4 and 6-2. The final game was with Chung-ang University. At first, Dongguk seemed to lead the game. Yet, Chung-ang followed up quickly making 6-6. Then Hong Seong-eun, the first batter of Dongguk, hit a solo homer and Lee Seung-min made a three base hit making the score of 9-6. 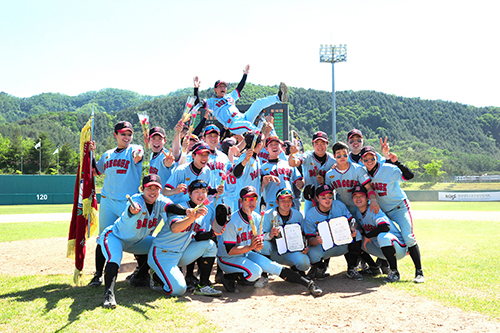 Through this victory, Dongguk was able to reclaim its seat as the university baseball champion after two years, winning four National University Baseball Championship in total.